Vehicles powered by hydrogen fuel cells generate no exhaust emissions other than clean water vapor. Unfortunately, producing and distributing large quantities of hydrogen gas is impossible with current infrastructures. Researchers are instead turning to on-board fuel processing -- using small-scale reactors to 'reform' gasoline into hydrogen with the help of high-temperature steam -- to aid implementation of this alternative technology. Luwei Chen and co-workers at the A*STAR Institute of Chemical and Engineering Sciences and the National University of Singapore have now developed a catalyst that makes on-board hydrogen generation safer and easier to perform than ever before. By combining the beneficial properties of two metals into a nanostructured material, the catalyst can eliminate carbon monoxide (CO) emissions from the low-temperature steam reforming of ethanola significant advantage over current approaches. Ethanol is an attractive fuel for on-board hydrogen generation because it can be sourced from renewable biological materials. However, the steam reforming of ethanol is a complex procedure with many possible byproducts. Some of the most serious contaminants are carbonaceous deposits, known as coke, which plug up catalysts and prevent them from working. Operation at high temperatures of 550800 °C can mitigate coking effects, but these conditions also lead to more CO gas emissions during the reforming reactions. The research team resolved this dilemma by combining rhodium crystals, which can catalyze ethanol steam reforming at low temperatures, with iron oxide nanoparticles onto a solid substrate. 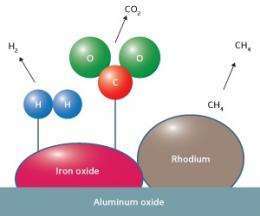 Chen explains that iron oxide catalyzes the watergas shift reaction, an additional process that converts CO and water into hydrogen and carbon dioxide (see image). These two components work together in the same temperature range, making them a good match, she says. Experiments revealed that this new substance performed admirably at temperatures of 350400 °C, yielding about four units of hydrogen gas from every ethanol molecule, with no CO byproducts. Furthermore, the rhodiumiron oxide system had an extraordinarily long lifetimesteam reforming could proceed for over 300 hours without coke deposits deactivating the catalyst. Additional analysis provided the researchers with a plausible mechanistic understanding of their discovery. While the strong bonding between CO and rhodium creates coke deposits, the presence of iron oxide disrupts this chemical equilibrium. CO molecules migrate from the rhodium over iron nanoparticles, where they undergo a watergas shift reaction that enhances hydrogen output. According to Chen, removing CO emissions from bioethanol steam reforming should lead to the design of simpler and cheaper on-board reactors, bringing these devices one step closer to widespread adoption. More information: Chen, L. et al. Carbon monoxide-free hydrogen production via low-temperature steam reforming of ethanol over iron-promoted Rh catalyst. Journal of Catalysis 276, 197200 (2010). 2000/US oz average price for Rhodium. Seems high for widespread use.